Medicaid and the Children’s Health Insurance Program (CHIP) are often mentioned in same breath. Both programs provide quality health care to children from low income families. Both programs are administered by states according to minimum federal standards. And both are financed using a combination of federal and state funding. CHIP is sometimes described as “standing on the shoulders of Medicaid.” However, CHIP and Medicaid not only work in concert with one another, in some states CHIP is Medicaid. Most states run their CHIP programs entirely or partly through Medicaid, either by expanding Medicaid eligibility or offering a combined Medicaid-CHIP program. Only two states, Washington and Connecticut, operate completely separate CHIP programs. Fourteen states have put all their CHIP-eligible children in Medicaid – called Medicaid expansion CHIP. (This is not to be confused with the Affordable Care Act’s expansion of Medicaid to certain low income adults). 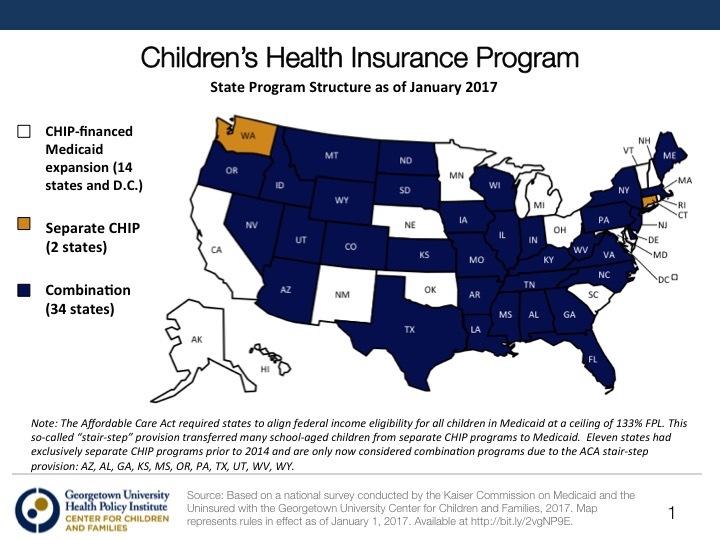 The remaining 34 states have implemented a combination program (also known as a hybrid) using CHIP funding to provide Medicaid to lower income children; while placing those at higher income levels (or age cut off) in a separate CHIP program. All children who are in the CHIP-as-Medicaid programs are entitled to full federal Medicaid protections. These include cost-sharing limitations and Early and Periodic Screening, Diagnostic, and Treatment (EPSDT) services. EPSDT services are designed to foster childhood growth and development so that children in low income families receive the health check-ups and treatments they need; and to ensure that children do not suffer from health conditions that may be treatable and preventable. Children who are in separate CHIP programs, without full Medicaid protections, still receive robust benefits. Studies show that CHIP provides better coverage for children, and at lower cost than private health plans. CHIP remains an important component of children’s health care, even with the new coverage opportunities made possible by the Affordable Care Act, leading to an unprecedented reduction in the number of insured children. Nine million children are enrolled in CHIP and more than 37 million children enrolled in Medicaid, while 1.1 million children are enrolled in Marketplace plans. However, the clock is ticking on CHIP, which is set to expire on September 30, 2017. The Medicaid and CHIP Payment Access Commission (MACPAC) warns that if Congress fails to renew CHIP before the deadline, states will begin running out of program funds by December, with most state depleting their CHIP funding by early next year. The uncertainty of CHIP’s future is already having an effect. States are gearing up to establish waiting lists and send out disenrollment notices to anxious families. CHIP has long enjoyed bipartisan support, beginning when the program was first created in 1997 and reauthorized in 2009; continuing in 2015 when Congress passed a two-year extension. Last year, NHeLP joined hundreds of national and state advocacy groups urging Congress to extend CHIP. Let us hope that Congress and the Administration can set aside the rancor and division of the last 9 months on what should be a non-controversial proposal – healthy children.